NWN Z-mat has been built around sophisticated mathematical material models, numerical algorithms, and tools such as stand-alone simulator and optimization program, in a modern software framework. A vast majority of the material models have been experimentally verified and validated in our own lab facilities. Many of these material models are being used in day-to-day design and simulation of high value components by enterprise customers. A wide variety of fail-safe algorithms with controls. See this data sheet for more details. Z-sim: GUI or input file driven material simulator for homogeneous deformation at a material point lets you specify either a history of stress or strain components along with a set of controls, in order to get response of any supported material for uniaxial, biaxial, simple shear or other possible deformation states. Z-opt: Works with Z-sim or full blown boundary value problem that is FEA simulation to optimize the material coefficients from a given set of test data. 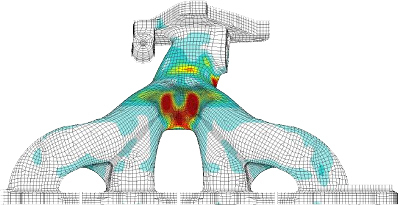 Z-post: Examines FE simulations effectively to produce valuable insight. Some of our life time models are also calibrated against test data from our lab facility. External Links: The modern software framework permits connections with major FEA programs. The following internal connections are also possible. Z-post with Z-sim and Z-mat Library for reliable fatigue life predictions. NW Numerics’ 8.3 version is based on “Z-SET Base” from the early 2000s. The initial author of Z-SET Base is the Centre des Materiaux d’Evry, common research center of Mines ParisTech and Armines.